“Tree hugger.” We’ve all heard this term before, used to describe those invested in protecting the environment, ourselves even. But where does it really come from? I decided to do some detective work and find out. The term “tree hugger” was first coined 1730, when 294 men and 69 women of the Bishnois branch of Hinduism, physically clung, or “hugged” the trees in their village in order to prevent them from being used to build a palace. These “tree huggers” were then killed by the foresters cutting down the trees. However, their lives were not lost in vain. A royal decree was established that outlawed any trees to be chopped down in Bishnoi villages. This heroic Bishnois movement inspired another similar movement in 1974 in Uttar Pradesh, India, where a group of peasant women hugged trees and used themselves as a physical barrier to protect trees from being cut down. This practice became known as “tree satyagraha” and spread throughout India, culminating to the Chipko (meaning “to cling) movement. This movement forced deforestation reforms and greatly affected the trees in the Himalayan region. 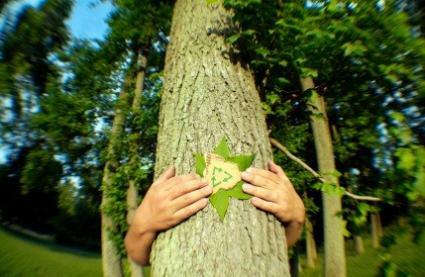 Thus, while “tree hugger” may have a negative connotation for having some sort of strange physical relationship with a nonhuman object, the original tree huggers were ahead of their time and one of the first radicalists for the environment. As we all know, with less trees, there is less oxygen and more CO2, so the original tree huggers are heroes in my book. God bless and rest their souls. I never knew. Thanks for sharing!